Home » The Transmission Physician Videos » Transmission Repair Tips – Why Are Transmissions So Expensive? No doubt about it: auto repairs have gotten expensive and automatic transmissions are no exception. But don’t get the wrong idea; no one’s getting rich fixing your transmission. The parts make up a sizeable portion of the bill. They include all the normal wearing items, such as the clutches, gaskets, and seals. And today’s transmissions consist of thousands of individual parts, in dozens of subsystems. Even the tiniest broken spring or damaged check valve can cause a transmission to melt down into a pile of scrap metal. 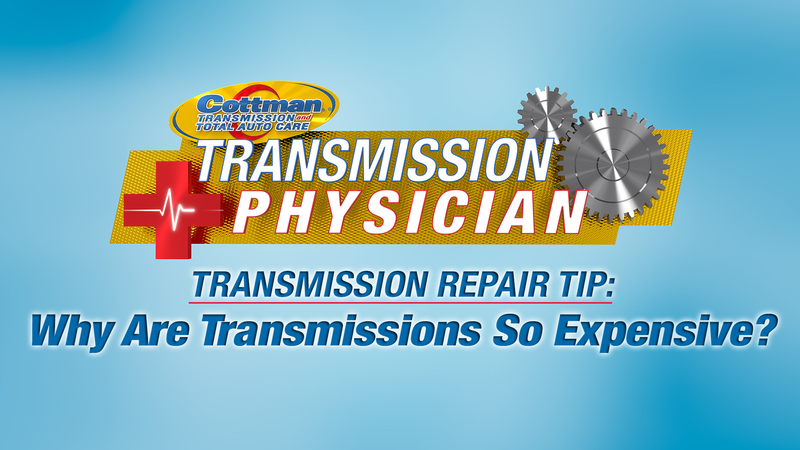 The transmission physicians at your local Cottman Transmission and Total Auto Care center spend hours combing through each component to make sure your transmission works right and keeps working for years to come. What’s more, when you bring your transmission problem to your nearby Cottman center, you can be sure you’ll never pay for a transmission unless you really need one.